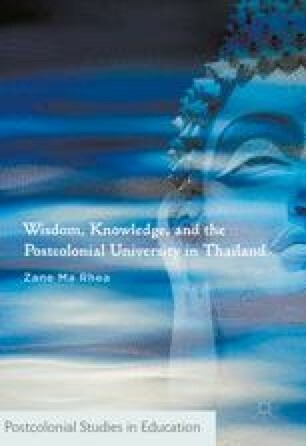 This chapter develops an understanding of the Thai university sector suggesting that it is finding a balance between the sorts of knowledge found in the university exchanges discussed in previous chapters with what is uniquely Thai knowledge and wisdom. It argues that there has been a shift in understanding of panjaathaanglohk worldly wisdom and the various types of knowledge that supports it. The challenge for Thai people is how to negotiate such a shift. The pressing concern is that these newer understandings of formal knowledge cultivation in Thai universities are, as yet, “unsettled” as reliable signposts to enlightenment, to becoming a wise person, and that the knowledge of the old pathways and knowledge ecologies are in danger of being forgotten. ———. 2002b. “Raising Awareness of Indigenous Knowledge in Science and Technology Education.” Last Modified 16122015. http://www.scidev.net/en/policy-briefs/raising-awareness-of-indigenous-knowledge-in-scien.html. ———. 2013a. “Buddhist Wisdom and Modernisation: Finding the Balance in Globalized Thailand.” Globalizations 10 (4):635–650. doi: 10.1080/14747731.2013.806739. Moreno-Black, Geraldine, Prapimporn Somnasang, and Sompong Thamthawan. 1994. “Women in Northeastern Thailand: Preservers of Botanical Diversity.” Indigenous Knowledge and Development Monitor 2 (3):24. http://www.nuffic.nl/ciran/ikdm/2–3/articles/moreno.html. UNESCO. 2003. A Place for Indigenous People in Protected Areas, Surin Islands, Andaman Sea, Thailand http://www.unesco.org/csi/act/thailand/assess7.htm. [Online]: Environment and Development in Coastal Regions and in Small Islands.